On the 25th October 2013 we will be at the TEDxBrighton Ideas Lab with an exhibition about Mass Observation and our current activities. The theme of this year’s TEDxBrighton is “Legacy & Heritage: What was, what is, what will be and what could have been”, so it is quite apt that we will be there. 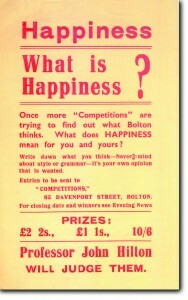 We are planning to showcase some of the research that Mass Observation did in Bolton in 1937 around happiness. We are hoping to gather some updated data at the Ideas Lab through Twitter using the hashtag #HappyMOA. We will be retweeting throughout the day, so be sure to follow us. Explore the relevance of social science research through the theme of happiness and discover how ordinary British peoples beliefs of the 1930s and 1990s can inspire your own creative writing. Advance booking for the ‘What is Happiness?’ is required. Please email: moa@sussex.ac.uk or call 1273 337515 to request a place.